I love baby new potatoes, but they cost the earth when they arrive in the supermarkets in the late spring/early summer, and quite frankly you don’t know how long they have been out of the ground – new potatoes should be cooked as soon as possible after harvesting. 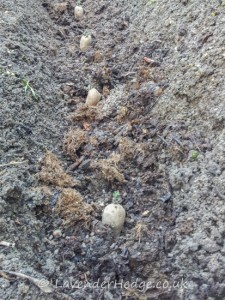 First early potatoes are ready to harvest in approximately ten weeks from planting, so in order to be able to have some lovely new potatoes to eat in either middle to end of May, I decided to make an effort and get some first early potatoes planted at the beginning of March this year. Our heavy clay soil is hard to work at the best of times, but I did manage to dig a trench and add a good dollop of homemade compost and a handful of chicken manure pellets, before adding my Sharpes Express seed potatoes, which I had previously chitted and the fat green shoots were just right for planting up. I added some chicken manure pellets to give them some extra nourishment and then infilled the trench. After it has rained and the birds have had a good peck over the soil, I intend to cover the row with a cloche to warm the ground up a bit. When the shoots start to break through the ground, I will mound up the soil to protect the shoots and encourage more potatoes to form. 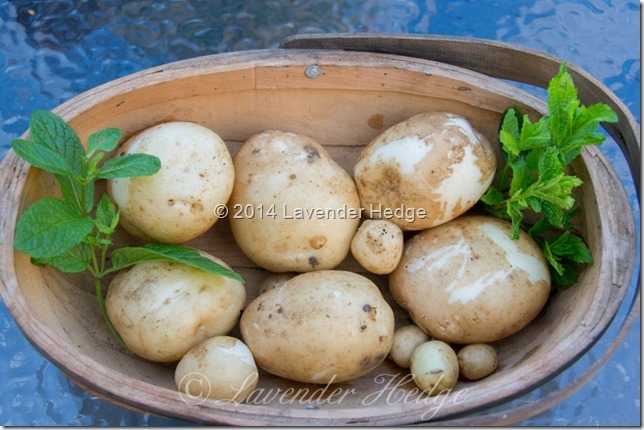 It is also important to protect them from sunlight as that will cause the potatoes to go green, which is poisonous. 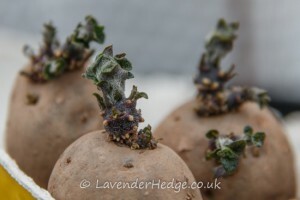 I still have some Charlotte second earlies to plant, but will wait a few more weeks before I plant them, in order to stagger the harvest times. A couple of days after I planted these we had the heaviest rainfall in a single day for 18 months, making the ground totally unworkable – so I was pleased to have got these planted. However the following two months have been much colder than normal for the time of year. I dug up a root on 30 May 2016 – twelve weeks after they were planted out – and was very disappointed with the results.